Washington is moving around its heavy bombers like chess pieces as it attempts to deal with growing threats around the globe. B-52s are already deployed to Spain, but others will also take over for the B-1 as the U.S. Air Force’s ISIS pounding precision bomb truck. In the Indian Ocean, B-2 stealth bombers will be heading to American island outpost Diego Garcia to project power across Asia. Diego Garcia, which is located with the British Indian Ocean Territories, was a bustling epicenter for USAF bombers and tankers during the wars in Afghanistan and Iraq. Today its airfield is far less active but the island remains a strategic outpost for the US and its allies. The B-2s’ deployment to Diego Garcia comes as tensions are higher than ever in the South China Sea. Just last week the U.S. Navy sailed a carrier strike group into the heart of the disputed body of water, once again challenging Beijing’s blanket claim on the territory. North Korean saber rattling has also come to a crescendo with proclamations that the rogue nation is readying its nuclear arsenal for a preemptive strike on South Korean and American forces taking part in the annual bilateral “Foal Eagle” war games. This statement was supported today by a picture showing what appears to be Kim Jong Un examining a miniaturized nuclear device. F-22 Raptors are also deployed to region and to South Korea in response to the North’s increase in threatening acts. The B-2s’ presence in the region will not come at the cost of the regular nuclear-capable bomber rotation to Guam. B-52s will continue their presence there as planned. One of these aircraft was recently used as a show of force reminder to North Korea following an underground nuclear test. It will be interesting to see if the B-2 makes an appearance over the South China Sea. Along with the carrier strike group’s recent presence there, the B-2 represents the most potent reminder of America’s military might and its stealth qualities have the ability degrade the potential effectiveness of any anti-access strategy China wishes to install in the disputed body of water. As for the fledgling war against ISIS, B-52Hs will be deploying to CENTCOM’s area of responsibility to joint the fight. Just recently, the B-1Bs, that have been stars of the conflict, were withdrawn after a very long steady presence in the region. The B-52s, which are also equipped with targeting pods, will likely pick up the slack. in April when Air Combat Command boss General Hank “Hawk” Carslisle says they will deploy. Both the B-1 and the B-52 fleets are undergoing upgrades that will enhance their combat capability and reliability. Either type will almost certainly be modified further into the USAF’s arsenal ship concept that will fly by the end of the decade. The heavier reliance on bombers as foreign policy tools as of late underlines the case for the B-21, America’s next bomber that is currently in development. Currently, the B-2 is the only strategic aircraft in the Pentagon’s arsenal that can penetrate enemy air defense systems, and even its abilities to do so are eroding as it ages. It also has the range to infiltrate past an enemy’s anti-access capabilities, something other stealthy aircraft like the F-35 do not, putting them outside striking distance of well equipped enemies in the future. 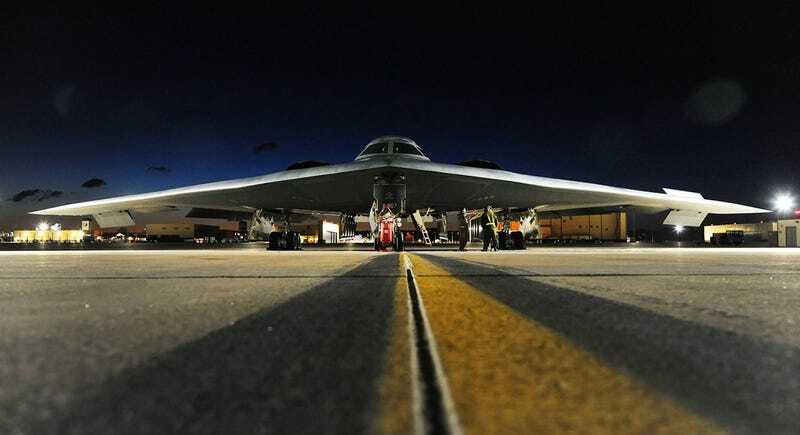 The fact is that there are only 20 B-2s in existence—the majority of which are down for maintenance, overhaul, or modification at any given time, or are being used to sit nuclear alert and provide training. The USAF has made it clear that it needs 100 B-21s, and such a fleet would give the White House and commanders many more options, not just in combat but also when it comes to using military power projection as a foreign policy tool.